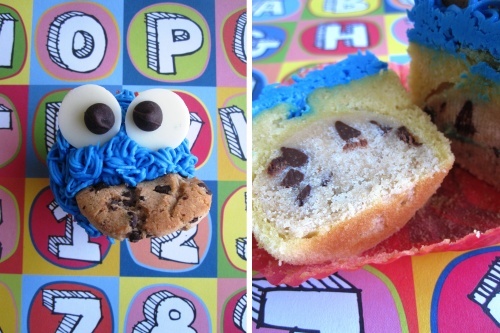 I had seen these cute little cookie monster cupcakes around on the internet, done in various shades of blue with different techniques for the eyes and fur. I knew I had to take a shot at them after stumbling upon what I can only describe as a stroke of maddness genius–a cupcake with a cookie dough center. Yes, it’s true. These are simple and can be made even simpler if you choose to use store bought cookie dough and box cake mix (and I assure you that there is no shame in that). The cupcakes actually cook with the dough inside, and the key is to follow the instructions down to the commas because if you under freeze the dough, the result will be a dry or possibly cooked cookie center. Great for kids, a coworker told me how excited his son was when he bit in to the cupcake to find that the cookie monster had eaten a cookie– it was in his belly!